One morning -- no one recalls exactly when -- they simply left the lights off in half of Qwest's Idaho Falls call center. Only the computer screens glowed in that half of the large semi-circular space, reminding the remaining employees of colleagues who had quit or were fired and not replaced. At the soda machine, people were counting the years remaining on the building's lease. Surely the company would at least see the lease through -- or would it? 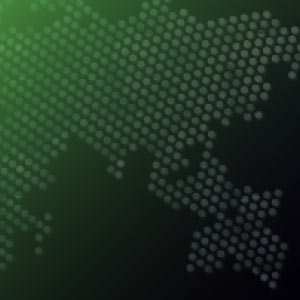 The center's results were poor, consistently near the bottom of the 11 such sites Qwest Communications International maintains around the United States. Attrition was high. Attendance was low. Customer satisfaction scores and revenue were poor. The telecommunications firm had stopped recruiting in the area, and the end seemed as near as the dark side across the room. "We were all pretty much figuring we were going to be gone at some point," says Donna Jenkins, a telephone representative. "I would think of any reason not to go to work," says employee Chyanne Smith. "I would think, 'Somebody hit me with a truck. I do not want to go to work today.'" Doors were sometimes slammed. Employees occasionally overheard each other crying on the phone to their friends. Some petitioned for transfers to other Qwest call centers. The union and local management were at odds. Employee grievances were at an all-time high. Employees were fearful and not motivated. Rumors of the problems spread to Qwest's Pocatello, Idaho, call center; refugees from Idaho Falls were willing to drive the 50 miles for better working conditions. In April 2003, Qwest tapped 13-year company veteran Larry Walters with the daunting task of pulling the Idaho Falls operation back from the precipice. He not only saved the center from possible closure, but he also made it the largest and best site in the company. How he succeeded is a lesson in what employees will do when they know their manager cares about them and gives them a vision of what they can accomplish together. Walters accepted the assignment without hesitation and packed to make the move from Helena, Montana, to the troubled call center in Idaho. Honored by the opportunity, he required only a "two-minute conversation" to be drafted. "Within 48 hours, I was here, living out of a hotel," he says. Things began to lighten up even before Walters arrived. Employees were happy to see a change -- any change -- coming. They were encouraged by the little they knew of Walters from his occasional visits to Idaho Falls. He always made sure people had coffee. He asked about their interests. He seemed genuinely curious about their lives. But now, he was more than an incidental visitor, and time was running out for the center. "I knew I could get it turned around, but could I get it turned around quick enough to have an impact on our customer service -- and quick enough for Qwest?" Walters says. Walters embarked on a fourfold strategy: embracing the front-line associates, emphasizing results, talking straight with the union, and distancing himself from some of the six "coaches." He feared that these managers -- who reported to him and supervised 10 or 12 telephone representatives -- were holdovers from the previous management days. Larkin Beauchat was a coach who was hoping for something better. He was hanging on; "It was just a job" at that point, he says. But he was eager to rally behind a genuine leader. "That first day, Larry called us in and said, 'We're currently in last place. Out of 11 call centers, we're 11 th. We need to turn that around,'" Beauchat says. "He then said that managers' jobs were on the line and that over the next two to four months, each one of us was going to be evaluated on our performance, as well as by Larry's feeling of what's going on in the center." "What struck me most was his willingness to jump in and try to change the mindset," says fellow coach Matt Tower. The first meeting with the managers that morning, Walters recalls, revealed one of his toughest challenges "because most of the managers did not want to change. They took the attitude that 'We're doing it our way.'" Walters didn't mind rattling the recalcitrant coaches. In fact, if they were determined to dig in, he was going to use their conversion or dismissal to send a message to the call center reps who had been intimidated by some of the coaches. "When I went back to that hotel room, I was thrilled," Walters says, "because those coaches came out of that room scared, and the front line saw it -- and the reps saw that something was going to change." Walters struggled to get four of the coaches to work with him, to get them to stop managing by intimidation, to learn more about the phone system, and to understand the reps' frustrations. One by one, they failed the test. "I just couldn't get them to turn around. They would say the right things to my face, but they wouldn't walk the walk -- turn around and do it the right way," Walters says. Beauchat and Tower welcomed and survived the change. The other four coaches did not. Walters' meetings with the union were described by both sides as straightforward, candid discussions that set the foundation for an excellent working relationship. Kathy Berger, an employee at the Idaho Falls call center and secretary-treasurer of Local 7621 of the Communications Workers of America, describes Walters in language uncommonly effusive for a union steward. "He is so my hero," she says. "He is absolutely everything to me." Walters earned that praise, Berger says, by being consistent and direct. He meets with Berger every Tuesday at 10:00 a.m., almost without fail, to discuss any issues. He never shades the truth, she says, and he seems to understand that by increasing union membership and giving members more fulfilling jobs, the health of the center does as much for the union as it does for Qwest. "We just hit it off and agreed to work together to make things better," Berger says. "There was no more of the (local managers) having secrets and not letting anybody on the union side know. His attitude was, 'You have a problem? Come to me, and let's talk about it. I'm going to tell you what I'm hearing; you tell me.' I don't think I've ever seen a better union-company relationship than in our center, and Larry is just totally, I mean totally, to be credited." Berger says that she knew things were going to be different when she and Walters were working their way through a grievance that one of the employees filed. After they were done, Walters suggested, "The next time you have a grievance, let's try this: Come talk to me before it gets to the grievance procedure, and let's see what we can do." When the next disagreement occurred, Berger took him up on the offer. Walters understood the employee's concern. They reached an agreement, and the grievance was avoided. As a result, grievance filings in 2004 were about half of what they were when morale was at its lowest, even though the center now has more than six times as many employees. When Walters arrived at the call center, he was surprised not to find the site's results posted prominently. He set about to fire up the team to get out of the basement of Qwest center standings. "As far as decorations on the walls, it looked fine, but there were no results on the walls! Within the first week after I arrived, results were posted on the walls. How do we rank for our sales, for our customer service, for our attrition? How do we rank against the other centers? I wanted to start building that sense of pride in our center and what we do." He egged them on. "I was actually showing people, 'Do you realize we're last in sales right now? Does that bother you?'" The focus on results might have landed flat but for Walters' secret weapons -- a genuine concern for his employees combined with a theatrical, self-deprecating motivational style. Walters' employees can run through a litany of costumes and stunts he's used to put the team in a great mood. He puts on in-line skates and rolls through the center singing and playing the guitar. (His associates hasten to mention he doesn't know how to play the guitar.) One day, Walters bought hamburgers for everyone at the nearby Sonic Drive-In and talked the restaurant into loaning him a Sonic milkshake costume that he could wear while passing out the burgers. Lisa Roberts, whom Walters recruited from Pocatello to be a coach, recalls first meeting him in a "Captain Bendo" costume. She's since bought him a full-sized SpongeBob SquarePants outfit. But the costume that seems most memorable was a take-off from an agreement by Qwest to offer MSN Internet service. Walters got his hands on an MSN butterfly costume and floated through the office pumping up the troops. "Have you ever seen Larry? He's -- what? -- six-one, six-two, maybe 120 pounds soaking wet. He had an MSN butterfly thing with the hood covering everything except his face, and he would walk around the office in that. We'd have to put customers on hold, we'd be laughing so hard," Berger says. "It helps people feel like he's a real person," says Roberts. "It's not like, 'I'm over the whole center, and you should be scared to talk to me.'" Inside the butterfly, milkshake, or Captain Bendo costume is a manager who wants to know each of his employees and see them succeed. "I love these people, and I'm not just kidding," Walters says. "I know their names. I know their spouses' names. I make fun of them when their football team loses. The first thing out of my mouth in the morning isn't, 'How are your numbers?' Instead, it's, 'How was your son's Little League game last night? Who won?' It really brought the faith back that we're here as one team." Idaho Falls center employees recite two mantras Larry taught them: "For the love" and "You're all rock stars." Standing on a desk in the middle of the building, he tells them he loves them and that he believes they can accomplish great things -- messages they didn't hear before he arrived. "Larry changed my entire attitude about Qwest," Smith says. "Two years ago, I would have had nothing good to say about Qwest. Now people ask, 'Are you still there?' I say, 'Yes, and I plan to retire from there.' I'm proud to come to work, and I'm proud to say I'm a Qwest employee." Changing the management ranks, focusing on results, building a partnership with the union, embracing his employees, and leavening it all with numerous costume changes had just the right effect. The numbers posted each day got better. Customer satisfaction scores bumped up 5%. Revenue per call jumped 16%. Sales productivity skyrocketed 68%. Qwest leadership, seeing the turnaround, decided to begin hiring more people in Idaho Falls. The lights went back on throughout the building, which was abuzz with activity. 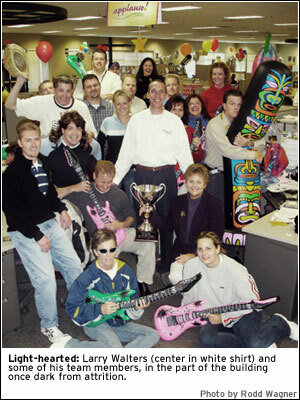 In March 2004, the Idaho Falls call center participated in The Gallup Organization's Q 12, a 12-item survey that measures employee engagement. (See "Feedback for Real" in See Also.) Employees who described their workplace in harsh terms just a year before scored their work life above the 70 th percentile of Gallup's North American database -- an unusually high level for such a large and unionized group. One afternoon, Paula Kruger, executive vice president of Qwest's consumer markets group, was in town visiting with Walters and discussing changes to the center. Gesturing to the building next door, Walters said -- half joking -- "In two years, I want that building." "Why wait two years?" she replied. "You're doing all the right things. Let's get to work on it." Key to the business case for hiring more people was Walters' success in motivating his team. It didn't make sense to hire more people if they were going to founder. But Walters' people were having too much fun, were too attached to him, and were succeeding too much to make that an issue. In April 2004, Qwest announced the expansion. Qwest officials and state dignitaries came to Idaho Falls for a large press conference. Walters bought dozens of permanent markers and asked them to sign their autographs on dozens of blow-up guitars he bought for his "rock stars." "I cried when they announced the expansion," Walters says. "There were about 150 employees at that announcement. They went berserk. They clapped and cheered and freaked out, and I started crying. Some of the managers cried." Among those in attendance was Idaho Governor Dirk Kempthorne, who leaned over to Walters and remarked, "I have never, ever seen such an incredible ovation. You should look into politics because these people love you, and they love what you've done." Down to just 65 people when it was in a single, half-darkened building, the Qwest Idaho Falls call center today employs more than 400 people in two buildings. Walters was recently promoted to site director over the team leaders who will each be responsible for the employees in one of those buildings. The call center, which two years ago was last in sales for the company, exceeded its January 2004 sales objectives and became first in sales. Balloons float from the cubicles. Large baseballs, "applause" signs, and a pirate flag hang from the ceiling. Telephone reps smile as they carefully stack the emptied cans of Mountain Dew, Coke, and Red Bull that keep them charging forward. It's now a fun place to work. And those who have been there long enough to know what the center went through find themselves grateful to Larry Walters for showing them -- in his unique way -- how to be rock stars. "To be on the bottom and now to be number one -- it's truly breathtaking to me," says Roberts. "It seems easy now, but we've seen the other side." Every manager brings unique strengths to the job, and those strengths are built on natural talents. Gallup research shows that managers who understand what they naturally do well are more likely to succeed. Below are Larry Walters' top five Clifton StrengthsFinder talent themes -- and how they contributed to his accomplishments. Restorative: Restorative talents lead people to take great pleasure in fixing what's broken. A typical Restorative person could be a nurse or a doctor who is particularly drawn toward identifying and resolving patients' health problems. He or she enjoys figuring out the root causes of whatever's broken, fixing those problems, and watching the subject bounce back to life. Larry Walters' girlfriend thinks he's a little nuts because he buys and restores classic cars that look like they are beyond hope. "Just like the old cars I buy, I saw what could be in the call center," he says. "I knew I could turn it around. The people were here. They just needed coaching." Woo: People with exceptional Woo -- talents for Winning Others Over -- revel in meeting new people; each encounter represents a chance to break the ice and make a connection with that person. Those with a lot of Woo also like to win the admiration of other people. Walters freely admits, "I do want to be liked." He spends much of his day working the rooms of his call centers, looking for opportunities to talk with his employees about their lives. He is anything but shy. "I have no problem striking up a conversation with any of them." His costumes and high jinks serve to break down barriers between himself and the telephone representatives. Communication: Communication talents are found in those who enjoy speaking to large audiences and want their message to be understood. That can be a challenge in the Idaho Falls call center, which has four large cubicle-filled spaces, each of them half of a one-story building. It's not easy to talk to everyone at once. Walters' trademark solution is to simply jump onto a desk in the middle of the room, shouting, "Fair warning!" so employees can finish their phone calls. Then, he launches into his address. "I like telling stories about myself," he says. "I want to relax them and get them to laugh." Learner: Learners enjoy the ongoing process of educating themselves. They continually look for more information they can apply in their jobs. Walters consumes whatever information he can find about competitors, best practices, and management strategies -- all with an eye toward finding ways of using that information to improve the Qwest call center. Positivity: Managers with exceptional Positivity exude a belief that it's good to be alive, that work can be fun, and that no matter what the setbacks, one must never lose one's sense of humor. Employees at the call center routinely talk about how Walters made them feel good about themselves and their abilities -- like "rock stars." After an extended period without much positive reinforcement, Walters' team badly needed his encouragement. "I'm always about what's good, what's right. Then, if I need to say anything on the negative side, there's already been much that's positive to balance it out."